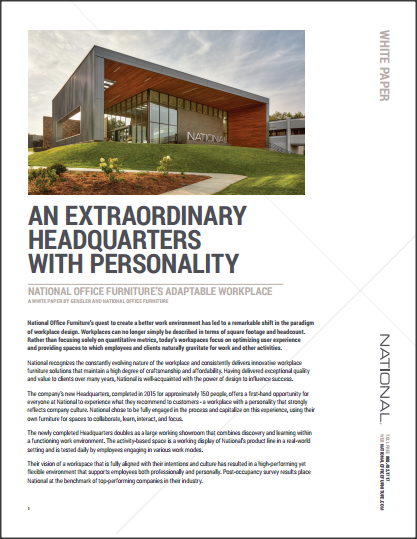 National Office Furniture has released a White Paper to highlight the ingredients to a flexible and agreeable office space for employees. National is a unit of Kimball International, Inc., and the White Paper they released outlines their own office transformation by evaluating their decisions based on how well they focused on employee well-being, productivity, and satisfaction. during their redesign. By partnering up with Gensler – a global research-based design firm – National Office Furniture conducted surveys to gauge how employees felt about their current work space & what they hoped would be modified in their office upgrade. We believe the key to an office redesign is to keep in mind the culture of your company and the nature of your employees – how they work, what type of work they do – when considering your office plan. They also make a great point when they mention that their office will “continue to evolve over time.” The office industry is forever evolving and so are the average worker’s habits. We’re always evolving! No single office space is going to be perfect for every kind of worker. Source: Monday Morning Quarterback. 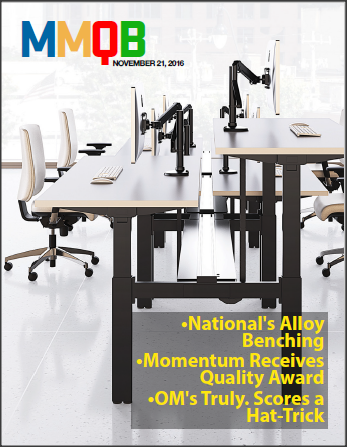 For more information, read the National Office Furniture White Paper. What Are You Thankful For In Your Workplace? How To Upgrade Your Office and Cut Your Tax Bill!